Well it happened more quickly than we thought it could. 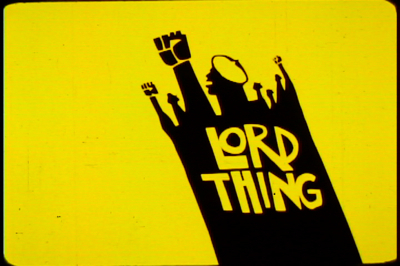 Last year South Side Projections and the South Side Community Arts Center presented a program that included CFA’s THE CORNER (1963, Robert Ford) and a VHS copy of LORD THING, a documentary on the Conservative Vice Lords shot from 1954 to 1969 made by Dewitt Beall. Over the years, the film materials to the LORD THING had disappeared. Mike Phillips of South Side Projections gave us some preliminary leads to trace the film elements and prints, but all became dead ends. That is when CFA contacted Buckey Grimm who said, “If it’s out there, I will find it.” And BAM, he did! CFA has received the extensive film materials used to create this extraordinary documentary that over the span of 15 years examines the evolution of the Chicago street gang called the Vice Lords. It “begins in the ghetto streets of the mid-Fifties— a virtual combat zone for dozens of small neighborhood gangs from different parts of the city [that in time unite] forces in a common cause.” The film unfolds within a period that begins when the Supreme Court struck down the practice of segregation to when the civil rights movement was at its height (1954-1969). In 1970, it won the Silver Medal in the Venice Film Festival, but never got into distribution. A huge debt of gratitude goes to film researcher extraordinaire Buckey Grimm who located the film materials with Elina Katsioula-Beall in California. She has cared for her husband’s films since his passing and is donating the Beall Collection to Chicago Film Archives. CFA will be submitting a proposal to the National Film Preservation Foundation to preserve this film that documents a typically inaccessible part of Chicago’s past. If you would like to be a preservation partner of our newest acquisition, the DeWitt Beall collection, give us a call at 312-243-1808 or email info@chicagofilmarchives.org.